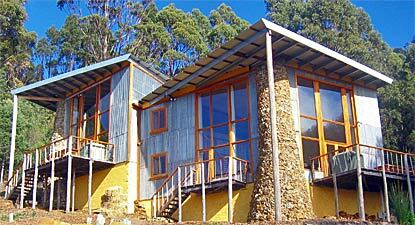 The Peppermint Ridge house located on Woodbridge Hill in Tasmania has views over Peppermint Bay and Bruny Island. The owners built it with their bare hands using an imaginative mix of strawbale, stone, galvanised iron and recycled timber. Large 5m high windows highlight the views. The main bedroom is a mezzanine tucked away under the eaves, with views to distant channel below.